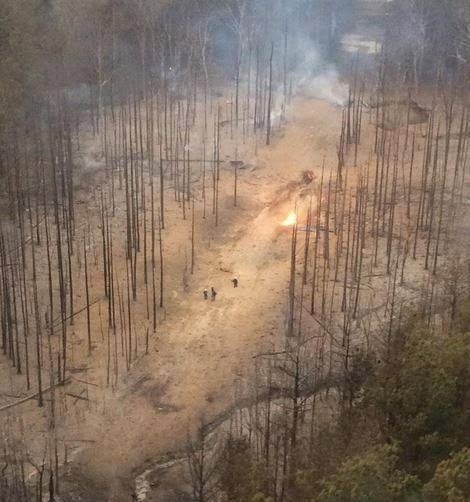 Natural gas pipeline explosion at 6:15 a.m. near Three Prong Trail in Fannin, Mississippi. No reports of injuries at this time, and I hope it stays that way. An aerial map demonstrates a couple of pipeline right of ways running through the Woodbridge Subdivision off Three Prong Road. Nearby homeowners said their houses shook. One of the lawyers in the firm just came in and said he clearly felt and heard it in the Palisades. WAPT has a number of viewer sent in photos that show the immense size of the explosion. Julia Weiden has an interesting picture on her Twitterfeed of the smoke and discharge showing up on their radar. The Clarion Ledger's report merely states, "a gas well has exploded at the Ross Barnett Reservoir. A fire is burning out of control. More to come." Obviously, this is a developing story. UPDATE: I received an update from PRVWSD indicating the explosion occurred in a remote area, heavily timbered, no houses around, no injuries, and the fire is now out. The above picture was emailed to me. I have no idea who took it, but it is awe-inspiring if from this explosion. Clarion Ledger has updated their story to confirm no injuries. Gulfsouth Pipeline operated the subject line. What a morning! The Reservoir Police received their first of many calls of an explosion and fire somewhere between Palisades and Goshen Springs at 6:26 AM this morning. Units from the Reservoir Police, Rankin County Sheriff’s Office, Rankin County Emergency Operations, and Lake Harbor & Reservoir Fire Departments converged on the area to pinpoint the exact location. The fire was believed to be a gas pipeline rupture near highway 43 off Old Highway 471. Fortunately the blast occurred in a rural area and pipeline officials quickly shut off the supply of fuel to the site. Our community is fortunate to have such a pool of dedicated first responders. These people run to the danger when others are fleeing for protective cover. In addition to the many agencies listed above, many other neighboring jurisdictions were either on scene or on standby to support or back fill our units to ensure the safety of our citizens. I honestly thought it was an earthquake until I looked out my front window. We are close to the site of the explosion. Windows rattled for about 20 minutes after. good grief! is this the same pipeline that Jim reported on the big fire/explosion back in the 70's? That picture was from Skycopter!